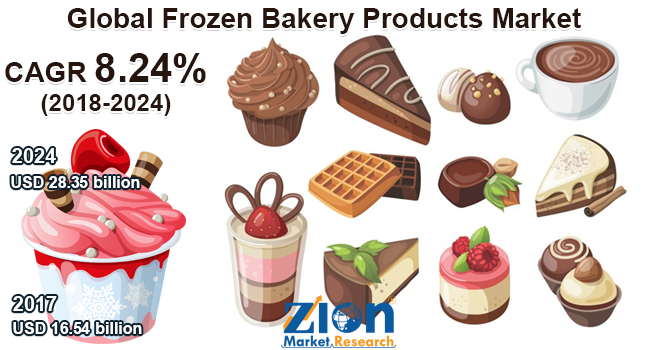 Zion Market Research has published a new report titled “Frozen Bakery Products Market By Type (Frigid Bread, Freezing Pastries, Frigid Cake, Cold Pizza Crust, And Others), By Product (Buns, Donuts, Rolls, And Others), and by Distribution Channel (Caterers & Bakers, Baker’s Shops, Industrial Catering, And Retailers) - Global Industry Perspective, Comprehensive Analysis And Forecast, 2017 – 2024”. According to the report, the global frozen bakery products market was valued at around USD 16.54 billion in 2017 and is expected to reach approximately USD 28.35 billion by 2024, growing at a CAGR of around 8.24% between 2018 and 2024. Bakery products such as buns, rolls, donuts, cakes, pastries, bread, cookies, pancakes, muffins have a very short shelf-life and are likely to get spoil by micro-organisms such as bacteria, yeast, and molds. Hence, consumers avoid purchasing bakery products in large quantity and like to have it fresh but in less quantity. Thus, storage of bakery products at a proper temperature is must to ensure to reduce wastage and safety. Consequently, the demand for frozen bakery products is expected to rise during the forecast period. As of now, bakers are more focused to provide more nutritional, fat-free, cholesterol-free, and healthy bakery products by including organic products and natural sweeteners. The market for frozen bakery products is projected to witness significant growth within the forecast period. Emerging techniques and product innovations in frozen bakery products improve the quality of baked products. For instance, hydrocolloids, antioxidants, enzymes, and sourdough fermentation enhances the flavor, texture as well as improves the shelf-life of the frozen bakery products. The advantages of frozen bakery products over normal bakery products like longer shelf-life, convenient availability, reasonable price, better quality, and environment-friendly manufacturing process are some major driving factors fueling the market growth. Meanwhile, rising obesity and growing health concerns, pH ranges in products are restraints of the global frozen bakery products market. Based on the type, the market is divided into freezing pastries, frigid bread, cold pizza crust, frigid cake, and others. The cold pizza crust is expected to attain more market share during the forecast period. The reason behind this is constantly increasing the popularity of cultural food (such as Italy is famous for Pizza) and rising demand for it in all over the world, additionally increase in imports and exports of frozen bakery products from Europe and North America is expected to obtain significant gains during the forecast period. On the basis of product, bun and roll hold a dominant position in the global market of frozen bakery products. Growing preference for the convenient and grab-on-the-go food in the breakfast menu across the world due to the busy lifestyle of people is a key factor for the market growth. Based on the distribution channel, the global frozen bakery products market is segmented into industrial catering, baker’s shops, caterers & bakers, and retailers. Retailers are the fastest-growing distribution channel as it has easy access to the frozen bakery products, availability of different varieties, and access to national & international brands in one store are factors driving the market growth during the forecast period. Europe is a fastest growing regional market. In Western countries, most of the peoples have a preference for the frozen pizza as a part of the daily meal. North America and the Asia Pacific are expected to show significant growth during the forecast period after Europe. For instance, in 2017 Grupo Bimbo Company, located in Mexico, announced the acquisition of Panattiere. This acquisition is intended to provide a beneficial opportunity to the Grupo Bimbo Company to tap into emerging markets by entering in-store bakery channels and food service. The report also includes detailed profiles of key players such Premier Foods Plc, Flowers Foods Inc., Lantmannen, Europastry, Findus Group Quality foods Cole Inc., Vaasan Oy, Maple Leaf Foods Inc., Cargill Incorporated, Bridgford Foods Corporation, Oetker-Gruppe, Aryzta AG, Lantmannen Unibake, Warburtons Baked, Deloris Frigid Dough Products, Associated British Foods Plc., Alpha Baking Company Inc., Grupo Bimbo, Pepperidge Farm, General Mills Inc., Barilla Holding SpA, General Mills Inc., Custom Foods Inc., Talos ZAO, and Kellogg Company. The detailed description of players includes parameters such as company overview, financial overview, business strategies, and recent developments of the company.